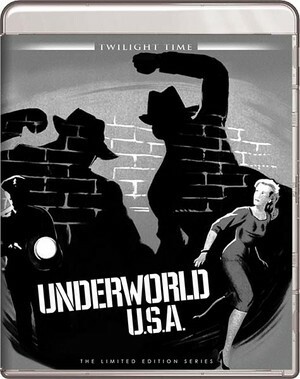 Underworld U.S.A. is a violent and compelling film noir from director Samuel Fuller. It has been released on Blu-ray by Twilight Time with an exceptional high-definition transfer courtesy of Sony. Plot: Fourteen-year-old Tolly Devlin sees four hoods beat his father to death. Twenty years later, the killers have risen to the top of the crime syndicate and Tolly has a plan for revenge. Run Time: 1 Hr. 38 Min. Peter Bogdanovich has referred to Sam Fuller as an iconoclastic director, an apt description. What other filmmaker would, in 1959, have made a movie (The Crimson Kimono) in which the white female protagonist prefers the company of an Asian police detective over his Anglo partner? Fuller drew upon his own experiences as a crime reporter to write and direct his next feature, Underworld U.S.A. While on the surface it might appear to a mob exposé, it is primarily a brutal tale of revenge. Tolly Devlin (Cliff Robertson) grew up as a street tough who rolled drunks for their money. One night he hid in the darkness while watching three hoods beat a man to death (a chilling scene even though all we see are shadows). From his hiding place Tolly recognized one of the men, and after he discovered that the victim is his father he vowed that one day he would have his revenge. Stretches in a reformatory and prison do nothing to mend Tolly’s ways, and while in prison years later he discovers that one of the men who killed his father is a seriously ill inmate. After managing to get himself a position as an orderly in the prison hospital, Tolly gets the sick inmate to give up the names of the other men who participated in the beating of his father. Those men are now prominent mobsters, and when Tolly’s prison sentence is up he embarks upon an ingenious way to get payback. Instead of planning to kill the men himself, he manages to get into the mob and plots ways to convince the boss, Earl Connors (Robert Emhardt), that the men who killed his father are turning on him. Along the way Tolly gets into a relationship of sorts with Cuddles (Dolores Dorn), a young woman who is marked to be killed by mob lieutenant Gus Cottahee (Richard Rust) before Tolly intervenes and saves her life. Cuddles wants to have a romance with Tully, but his single-minded pursuit of vengeance does not allow him to reciprocate her feelings. Cliff Robertson is steely-eyed, intense, and charismatic as Tolly, and the supporting cast is excellent. Richard Rust is chilling as Gus, who casually and without hesitation commits a shocking murder. Robert Ernhardt’s portrayal of the phlegmatic Connors, who has figured out how to shield himself by using legitimate businesses to front for his criminal enterprises, brings to mind the phrase “banality of evil.” Dolores Dorn, who spent most of her career doing television work, is suitably sympathetic as the needy Cuddles. Beatrice Kay turns in a fine performance as Sandy, the mother figure in Tully’s life. The 1080p black and white image is delivered in high definition via the AVC codec. It is property framed at 1.85:1 and the transfer is nothing less than magnificent. The image is sharp, black levels are superb, and shadow detail is excellent. I did not spot a single flaw in the presentation. The outstanding, stylish cinematography is by Hal Mohr (The Wild One, Destry Rides Again, Rancho Notorious). Readers are encouraged to take a look at the comments by our resident expert, the estimable Robert A. Harris. The English DTS HD-MA 1.0 mono audio is strong and free of any age-related anomalies. Dialogue is crisp and clear throughout, and the score by Harry Sukman (Fanny, Song Without End) has excellent fidelity. The extras on this Twilight Time release include a featurette entitled “Sam Fuller, Storyteller.” In another featurette Martin Scorsese expounds upon his admiration for Fuller. Also included is the original theatrical trailer and an optional isolated score track. The enclosed booklet contains a typically incisive essay by Julie Kirgo. If you have never seen a Samuel Fuller film, Underworld U.S.A. is a good place to start. I am confident that you will then want to see the likes of Pickup on South Street, The Big Red One, Shock Corridor, House of Bamboo, The Naked Kiss, and the aforementioned The Crimson Kimono (also available from Twilight Time). Many thanks for this review. I was going to pounce on this disc but I've noticed that a full Sam Fuller Blu-ray box set which includes this film is coming out in the U. K. any day now. The theme of a criminal choosing to avenge himself on his father's killers by working within the system was previously used in The Black Hand with, of all people, Gene Kelly. I must watch that again soon. I haven't seen it in decades and I don't remember much about it. I may pick it up when the next Warner Archive sale rolls around. Great review. I wonder if the Powerhouse release will use the same transfer?